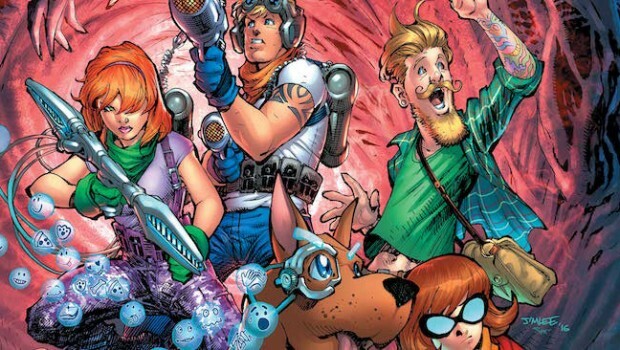 As part of DC’s “Rebirth” relaunch this summer, their Hanna-Barbera line is getting the Poochie treatment too with the most talked about title in that range being Scooby Apocalypse. 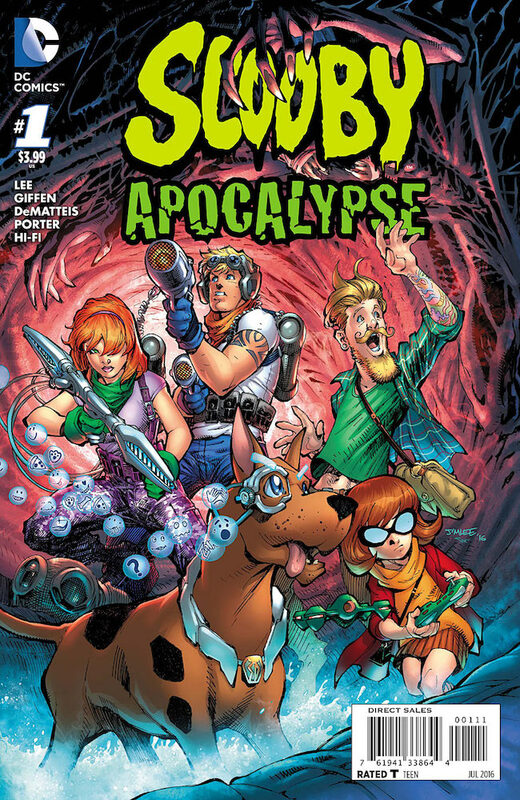 In this version the Mystery gang don’t know each other but they come together when shady government scientist Velma leaks the secret of an apocalyptic threat to hack TV people Daphne and Fred with dog trainer hipster Shaggy and failed government project Scooby-Doo also somehow getting tangled up in it. So is the comic any good? Jeepers, no! Right away it feels like older people trying too hard to connect with da yoof: we’re at Burning Man parody, the Blazing Man Festival, where Daphne and Fred are talking about their failed Mysteries TV show and getting it back to the top again with a new approach (a wink to the audience for what DC are trying to do with this book for the Scooby franchise as well). It immediately feels out of touch. They went from primetime on a major network to the 4am slot on the Knitting Channel – wouldn’t a more contemporary take be that Daphne and Fred are producing a Youtube show? I mean, why is “primetime on a major network” the goal when far more people now watch shows online than on their TVs? Daphne and Fred could take their Mysteries show to an online audience, unrestrained from network TV rules, and really do something interesting with it. But no, they’re aiming to be back on primetime TV, an almost dead medium, yawn. We find out that Daphne and Fred are meeting an informant at the festival – Velma – but that too is a weirdly anachronistic setup. Why would Velma leak information to a lowly TV show that no-one watches? Because the mainstream media are controlled or something, says Daphne – ok, but again, we live in a digital world where major secrets are leaked online, for example Wikileaks and Edward Snowden. Why wouldn’t whistleblower Velma go down that route? Because then she wouldn’t meet Daphne and Fred, sure, but it still doesn’t feel like the right solution that someone who’s written as a tech-savvy genius would choose. The clueless approach probably has to do with writers Keith Giffen and JM Dematteis both being in their 60s and still thinking in a 1980s mindset. Neither are writers I would say have much of a following these days and it’s easy to see why. The issue is horribly overwritten with clunky exposition hearkening back to a time when characters related plot points through tediously lengthy thought-bubbles. Here, Velma tells the reader her motivations while speaking out loud to no-one! The issue has no flow, it’s just packed with way too much bad dialogue. The Smart Dog program doesn’t really make sense either. Sure it’s a cover for what the facility is really up to but it still comes off as a convoluted plot point – does the military need weirdly-speaking tech dogs in combat situations when drones exist? There’s so much exposition yet Giffen/DeMatteis still can’t keep everything straight. One panel has Velma explaining that the facility is partly funded by the government, in the next she literally says the opposite, that it’s privately funded! 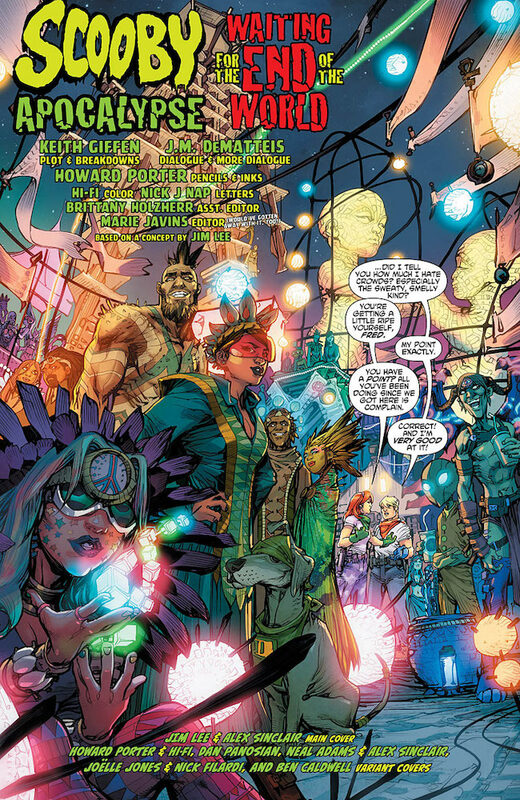 The main storyline of nanites and evil scientists trying to save the human race but not really was pretty incomprehensible to me – especially given the final page – but this is only one issue, maybe it’ll work given more time…? I don’t really have the faith that this creative team could pull it off though – just look at the unreadable disaster that was Justice League 3000! Shaggy and Scooby both still come off as likeable characters (even if the Google Glass-type gadget Scooby’s wearing – “Emotigoggles” – is a stupid addition) but Daphne is an overly aggressive ratings whore, Fred’s a tool, and Velma’s a heartless misanthrope. I’m supposed to be rooting for these guys? Maybe Shaggy and Scooby but these versions of the others can all go die in a cartoon graveyard! I suppose Giffen/DeMatteis can’t be entirely blamed as this comic is based on a concept by Jim Lee. I’m not a huge fan of Howard Porter but the guy deserves some credit for putting together some decent artwork amidst the writers’ excessive dialogue balloons. And I liked that final panel in the Shaggy/Scooby backup where we see their origin story – dog owners everywhere will understand. If Scooby Apocalypse #1 was intended to make readers excited for the franchise again, I’d say this creative team have screwed the pooch on this one. The more serious approach is uninspired and convoluted, not to mention laughably out of touch, the characters are less pleasing than their original versions, and the story is not at all interesting. 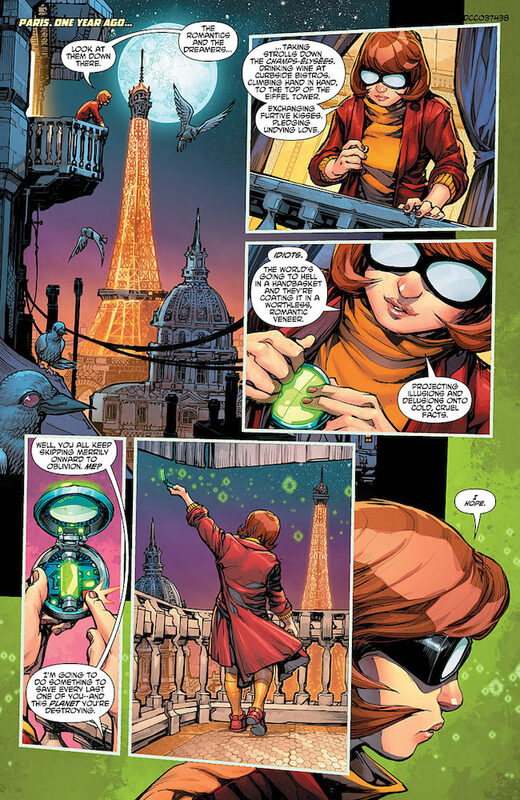 Maybe a younger creative team with a fresher vision could’ve pulled this off but for now Scooby-Doo continues to remain a long way off from being anyone’s must-read comic. Ruh-oh, not a promising start for the relaunch!